I like Yoplait yogurt. I really like Yoplait yogurt, actually. In fact, no other yogurt will do. Dannon? Sorry, not for me. Generic brands? Not a chance. As I was scarfing down a Yoplait Strawberry Kiwi yogurt (easily the best flavor), I wondered how much my commitment to Yoplait is costing me. After examining my yogurt-buying habits within the grocery budget, I wondered how much money I was saving with generic choices and how much more money I was spending each month on the popular branded item. This led me to conduct a brief experiment on a typical week of groceries for my wife and I. I scanned 16 food items at my local Wal*Mart store. For each item, I priced the cheapest option along with the choice I felt was most popular. I made sure the item was the exact same quantity, so as to truly compare apples to apples…err…applesauce to applesauce. Here’s a look at my results. This is a classic case of small choices having a fairly significant impact over time. Take the cream of potato soup item for example. I’d save 60 cents per week by choosing the off-brand can. Four times per month (assuming I buy a different style of soup with the same price difference) I’d reap a 60 cent benefit for a whopping total of $2.40 per month. This equates to $28.80 per year, and $144 over a 5 year period. If I make the same choice on 10 different food items, that’s $1440 dollars I save over the 5 year span. It made me think! It was helpful for me to go through each item and put real dollars and cents to the decisions. Waffles? I’m fine with the cheap box. I don’t think I can tell a difference in brands anyways. Yogurt? Don’t you dare try to sneak an off-brand into my fridge! For my thrifty friend, no-name brands are just fine except for ketchup. How about you? What items for you or your family does brand matter? How much taste or quality are you willing to sacrifice for a few dollars or cents each time you buy it? Read how Matthew saves his family money by using Ting Mobile for cell phone use. I used to love yoplait too. Then I tried Noosa-and cringed at paying $2 per container. And then I got an Instant Pot and learned how easy it is to make your own. No comparison. I get about 10 servings out of 1/2 gallon of whole milk. I also make a batch of granola on yogurt a Sunday, which is ridiculously easy. My general rule of thumb is to try the generic/store brand. If I can’t tell the difference, or it doesn’t make a difference, then take the savings. Shop sales and buy name brand when sale prices are lower than generics. This works out great for me, but I’m not that picky. My wife swears she can tell the difference between equal/sweet-n-low and the store brand equivalent. She rarely buys generic. Pretty much the only thing I won’t buy generic is cream cheese. It is Philadelphia or nothing. That is good stuff Lindsey! The cheapest cartridge razors generally are those compatible with Atra/TracII. You can buy online a razor that is compatible with these for less than $4. I bought a gillette vector razor for less than $4. I then bought a pack of ten Atra compatible razor cartridges that fit this razor handle from HyVee grocery store for $2.45. Those razors are made by Personna and they are cheaper at my HyVee than they are on the internet. In the past I used Gillette Sentra and got about a months use out of their razors. I have thin hair so maybe less than others. But the cost for a box of razor blade cartridges from most any store is in the mid $20s for 10 razor blade cartridges. Only a year and a half ago they were $15 and a year or two before that $10 and another two before that $5. This is price gouging and it ticks me off as a matter of principle so I started looking around for a solution to this obscenity. The HyVee razors use a 2nd/store/generic brand name but they are made by personna. If they hold up for an entire month my annual cost for shaving will be less than $3 or less than one cent a day. It’s actually far cheaper and far better than I was hoping I could achieve – so problem solved. Incidently HyVee offers a four pack of sensor compatible razor cartridges for $3, also made by Personna and also cheaper than what the Personna Sensor compatible razors cost on the internet. That means I could buy a year’s worth of sensor compatible razors for $9. That’s within reason, if only just barely. 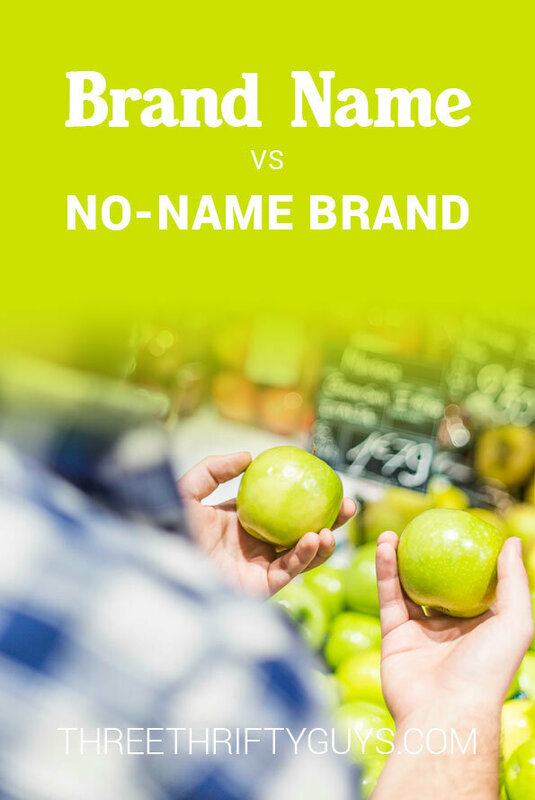 I would be curious to see the aggregated difference of the nutrients and calories for brand name vs generic. Me too Steven. I’m sure it would be alarming. The pros of saving more money are sometimes not worth it in the end. I disagree because there are often no rebates or coupons for brand name brands. I just bought a jar of Prego Sauce (with a free packet of basil seeds attached) for $0.48 after stacking a coupon and a rebate. I am so glad I am not paying these no brand prices. What a truly awful diet this list represents. Are you deliberately trying to become diabetic and obese? There are many generic or lower cost brands of items I actually like better than the original. And I recently switched from shopping at Safeway after the ownership switch to Fred Myer (Kroger). Fred Meyers has some good house brands. they are on sale often and they send me many many coupons in the mail & also e-coupons online to load to my card for many of their house brands. One thing I have found too is that it is not just about the taste. Sometimes the lesser or generic ones use lesser quality ingredients compared to the original like the types of oils or sugars or flours even. One time I could really tell the difference in a brand is with homemade Chex Mix. It is a staple in the house here in Nov/Dec. I have made it with generic versions of Chex type cereal and Crispix generic (‘Crispy Hexagons’!) and it turned out fine. But one year it tasted totally different and everyone said so. Turns out I had made it with French’s Worchestershire Sauce and not my usual Lea & Perrins. Never again. On the topic of yogurt, I was just at the store yesterday preparing for a Cub Scout campout – I need 40 yogurts. Walmart had eight packs of Yoplait yogurt for $3.98 apiece, making those 40 yogurts cost approximately $20. When I looked at the Wegman’s website, I saw that their 12-packs of yogurt cost $4.99 apiece, meaning 48 yogurts for the same $20, or $15 plus the cost of four individual yogurts. Generic is definitely the way to go here. Wegman’s isn’t everywhere, but their generics are always top notch, and I’ve been shopping there for a family of 4+ for over a decade. One great way to save money is by buying store-brand over-the-counter medicine. The formulas are exactly the same–look at the ingredients–and they’re generally much, much cheaper than the name-brand stuff. I think you have to follow it up with the review to see what products are OK to use generic and which are not….because some of those likely will not be as good for one reason or another. On another note, I think it’s interesting that you love Yoplait so much, because after they changed their forumla a few months back, I went from having it at or near the top of my list to finding it revolting and nearly intolerable to consume. Glad it’s more agreeable to your palate!